This report provides an insight into how mobile technologies can support district nursing teams to work more effectively with people in their own home or care home. It looks at where Scotland is today in the use of these technologies, and makes recommendations for what needs to happen to make them a reality for nursing teams on the ground. District nurses and their teams are a key workforce for delivering safe, high quality care in the community and ensuring people achieve the best possible health outcomes. Mobile technologies can support these teams to access the right information, in a timely way, to support high quality and person centred care. However despite the Scottish Government’s strategic focus on digital technologies, and the number of policy levers designed to work to enable a digital health and social care system, on-the-ground investment and implementation of digital technologies for district nursing has been slow and patchy. This report provides an insight into the current status of mobile technologies for district nursing teams. It was informed by interviews with district nurses and community nursing managers from seven NHS boards and with academics. Those interviewed recognised the benefits of mobile technologies for district nursing teams in terms of efficiency, improved quality of care, and a safer service. 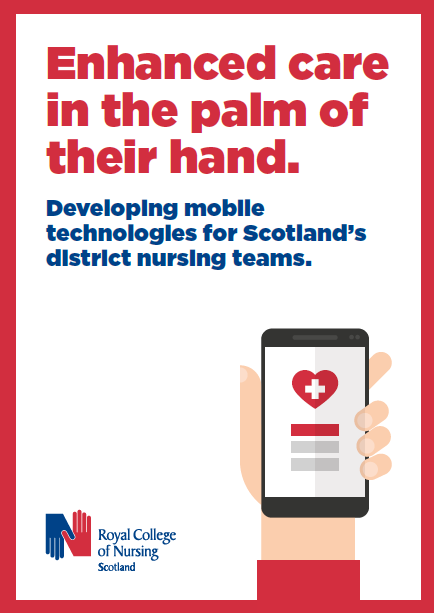 Ahead of the Scottish Government’s new Digital Health and Social Care Strategy, the report makes recommendations for what needs to happen to make mobile technologies a reality for district nursing teams on the ground.